Older adults will enjoy their experience at our local gym in Bethlehem, Steel Fitness Riverport. We offer group classes classes Tuesdays and Thursdays at 10:30 am like SilverSneakers and Silver & Fit, where you can exercise with others to improve strength, range of motion, balance and flexibility. More classes are coming soon like SilverSneakers yoga. 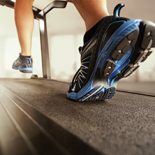 Our health club also features world-class personal trainers to work with you on a fitness plan and keep you motivated. Our group class instructors offer low impact options, like pilates and yoga; or you can try cardio training on our single-station equipment that allows you to work at your own pace. Get fit, have fun and make friends! Register for a free trial membership and try out all the amenities and services — including SilverSneakers and Silver & Fit — that Steel Fitness Riverport has to offer.